Shoes take a beating the moment you wear them out of the house. Over time, the toes of shoes may become nicked, which greatly diminishes the appearance. This is especially true for leather or patent leather shoes. With one easy-to-find product, you can repair small nicks in the toes of your shoes right at home. Wipe the shoe with a damp rag to remove any dirt or debris from the area. Use a dry rag to remove any moisture. Find a fingernail polish that matches the color of the shoe. 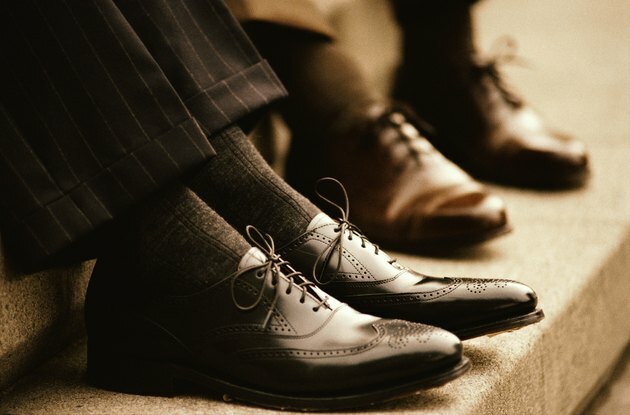 If you can’t find a perfect match, choose a color that closely resembles the color of the shoe. For small nicks, the color doesn’t have to perfectly match since it’s just a tiny area that needs to be repaired. Dab a thin coat of nail polish onto each of the nicks. Avoid swiping it like you would when polishing fingernails as this may get the polish on unintended areas of the shoe. Allow the nail polish to dry completely. Dab a second coat onto the nicks, if necessary, to thoroughly fill in the spots. Let the polish dry before wearing the shoes. Shoe repair kits are also sold online and at most shoe stores. Kits usually include a color applicator, adhesive and color compound. Follow the instructions included with the shoe repair kit, as this may vary among manufacturers. If the nicks are large or the fabric is torn, take them to a shoe shop for professional repair.